Less than a month ago, China ensured that its voracious economy would have a steady supply of Russian natural gas for the next thirty years. Indian press reports that Narendra Modi would like to follow Xi Jinping's lead and connect India to the vast energy resources of Russia. For a decade, Russian experts have been talking about making the country the top energy supplier in Asia and creating a North-South energy axis that will inevitably lead to closer relations between the biggest geopolitical players on the continent. It seems that India's newly elected Prime Minister is willing to take the necessary steps to make Moscow's dream a reality. 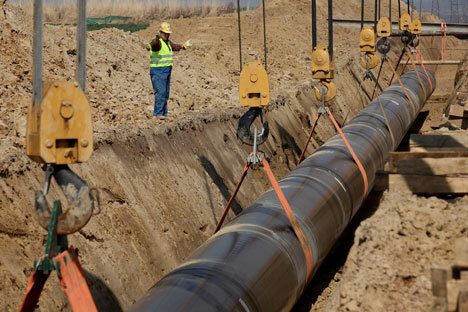 The Financial Express reported that Narendra Modi is considering an ambitious plan to extend the natural gas pipeline between Siberia and China all the way to India. The pipeline will link Russia's natural gas resources to Indian industrial and domestic consumers, drastically reducing the current exuberant energy costs that act as a drag on the country's economy. For Modi, industrialization is everything, because without industrialization he can't fulfill the promises he made to the India's poor and middle class citizens during the recent elections. However, industrialization without low energy prices is impossible and India's new leader is therefore obliged to seek cheap and reliable sources of natural gas and oil. The only reasonable option is to strike a long-term deal with Russia. Critics of the project may point out that deliveries of LNG from Qatar will surely be cheaper, but there are several factors that make Qatar an unsuitable choice for Modi. Firstly, Qatar is an unflinching ally of the US and therefore if India angers Washington, it risks losing Qatar as a supplier. For Modi, who is trying to promote an independent policy based on “India first” principle, this should be unacceptable. Another risk factor is that Qatar has the possibility to sell its LNG everywhere in the world and India will have to pay a premium on top of the global price in order to have a steady supply of LNG. A pipeline from Russia through China to India has its own political risks, but it will inexorably link Russia to India, making Russia a committed long-term seller. The Financial Express said that Modi will discuss this project at the upcoming BRICS summit with the Russian and Chinese leaders. If this ambitious project is approved during the summit, it will send a very strong political message to the world and will usher in a new geopolitical era for the Asian continent. First published by The Voice of Russia.